A church has existed here since medieval times and is recorded in the Domesday Book. The current church of St Nicholas was rebuilt in 1862-4 when the old parish church was too small for Sutton's growing congregation. It is surrounded by a churchyard with numerous trees including fine yews, and among the many tombs is an interesting mausoleum of 1777 to James Gibson and his family. Other old gravestones include two inscribed C17th slab stones and an early C19th monument to a blacksmith with an inscribed verse. Rail: Sutton. Bus. 80, 151, 164, 213, 280, 407, 413, 420, 726. Chertsey Abbey, having probably acquired Sutton in the first half of the C8th, is likely to have founded St Nicholas church. The current church was rebuilt by Edwin Nash in 1862-4, although a new wooden gallery had been erected to increase the seating capacity in the 1820s. 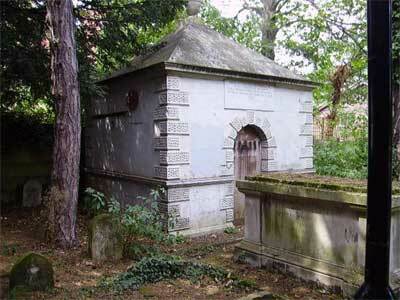 In the churchyard are many tombs including an interesting mausoleum of 1777 to James Gibson and his family, which has a pyramidal roof, rusticated quoins and door surround. The tomb is something of a mystery as there is no known connection between Sutton and the Gibsons. James Gibson had a varied career as a sailor, distiller, wine merchant, miller, and Master of the Worshipful Company of Ironmongers. The tomb was erected under the will of his daughter Mary Gibson and it is still inspected by the church on 12th August each year in accordance with her will. Other old gravestones in the churchyard include two inscribed C17th slab stones by the north aisle wall, and, parallel to the chancel window is an early C19th monument to a blacksmith with an inscribed verse. Under a thorn tree in line with the west door of the church, but now no longer visible, there is also said to have been a gravestone with an inscription that made reference to Mrs Elizabeth Pistor (d.1690), and two of her children 'who dyed young in the Great Sickness A1665' (see W G Bell 'The Great Plague in London', 1924, p 284, who wrote that he knows of no other inscription of this kind). Bridget Cherry & Nikolaus Pevsner, London 2: South, 1983; LB Sutton Heritage website; Charles Marshall, 'A History of the Old Villages of Cheam and Sutton', 1936 p88.